One of Nashville’s most well-known oncologists and Our Kids, a charitable organization providing services for abused children, were among the recipients of the 2015 Tennessee Medical Association annual awards presented last weekend during TMA’s annual convention in Nashville. Eric Raefsky, MD was honored posthumously with an Outstanding Physician Award, given annually by the TMA House of Delegates to member physicians who through their illustrious medical career make an impression among their colleagues, peers and on the profession of medicine. The award was accepted by his daughter, Stacy Maciuk. Dr. Raefsky had an endless dedication to his patients, serving more than 20 years as an oncologist with Nashville Oncology Hematology Consultants. During his outstanding career, Dr. Raefsky served as chairman of the oncology committee and the transfusion committee at Centennial Medical Center, chairman of the Department of Medicare at Summit Medical Center and as co-medical director of Alive Hospice, a pro-bono position he accepted near the end of his career. He has been listed by Consumer’s Research Council of America as among the country’s top oncologists. Dr. Raefsky has been honored throughout his career as a Frist Humanitarian Award Recipient, Nashville Chapter’s Man of the Year, Gilda’s Club Shining Star Recipient and the Sarah Cannon Cancer Center Celebration of Life Award Recipient. Nashville’s medical community deeply mourned the sudden loss of such an outstanding physician. Our Kids was named a Community Service Award winner, given annually to persons or organizations who contribute significantly to the advancement of public health in their respective communities. Our Kids is a charitable organization that provides healthcare, counseling and other services for children who are victims of sexual abuse. The organization was founded by the Junior League of Nashville in 1987, establishing a clinic at Nashville General Hospital and with Monroe Carell Jr. Children’s Hospital at Vanderbilt. It also operates four satellite clinics in Clarksville, Cookeville, Lawrenceburg and Manchester. Our Kids has treated more than 23,000 children and assisted thousands of families with education and referral services, providing medical evaluations and crisis counseling 24 hours a day. In addition to its primary mission, Our Kids seeks to increase community awareness, conduct research and offers education and training about child abuse, a service that no other agency in Tennessee currently provides. Executive Director Sue White accepted the award. Each recipient was nominated by the Nashville Academy of Medicine. 6:00 pm Tennessee Women in Medicine 2019... @ Home of president, Laura Lawson, MD. Tennessee Women in Medicine 2019... @ Home of president, Laura Lawson, MD. 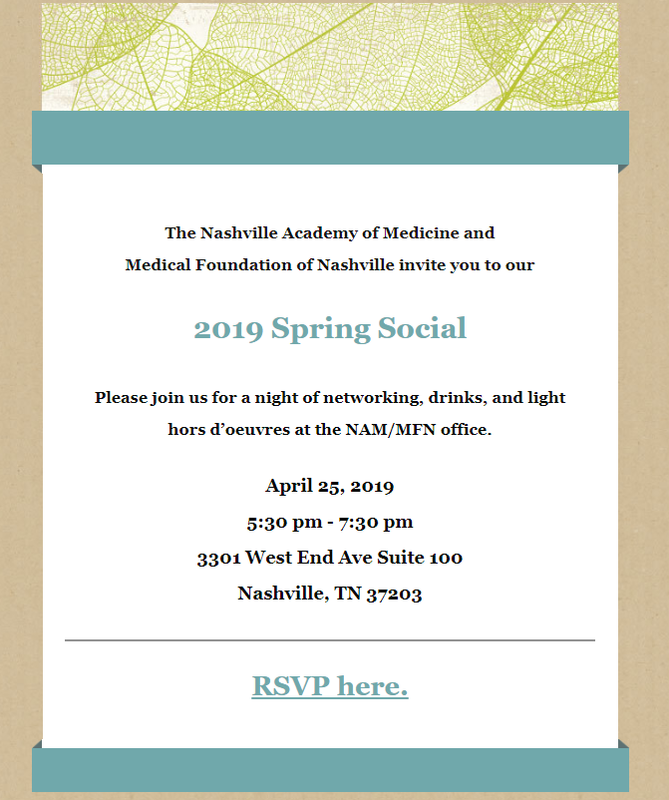 Sign up HERE to receive e-mail news from the Nashville Academy of Medicine. Click the icons below to connect with NAM on Social Media. Click here for general information about the foundation. Click the icons below to connect with MFN on Social Media.